Deer ticks used to be found primarily in wooded areas of the northern United States, but the tiny bugs and the diseases they transmit are now in every state in the country. If you want to protect your yard from deer ticks, there are animals that can help you win the fight against them. 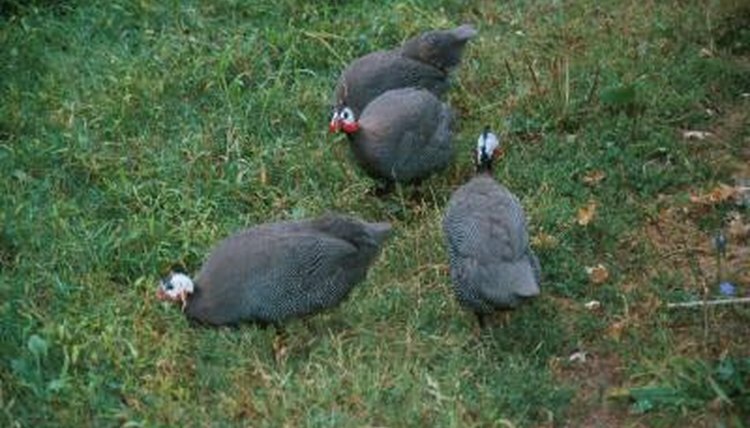 Guinea hens have become a popular defense against deer ticks. They can be allowed to roam your property and will eat any insect in their path. They prefer bugs that they can see on the ground or on plant leaves, and deer ticks are one of their favorites. They also devour weed seeds and snakes. They can be loud as they roam in packs about the property. Guineas are best suited to larger parcels of land they can roam freely, and they must be in an area zoned for poultry. Chickens are second to guinea fowl in eating deer ticks. They are not as effective because they won't roam the property as guineas do. They like to scratch the ground, so chickens can damage gardens or landscaping. They are prey for animals such as coyotes since they don't move as quickly or fly as well as guinea fowl. They must also be kept in an area zoned for poultry. Young wild turkeys are known to eat deer ticks, but not to the extent that they are effective in controlling the tick population. Wild turkeys enjoy small, crawling insects and can eat up to 200 ticks a day, according to the Pennsylvania Game Commission. A flock of wild turkeys that regularly visits an area can reduce the number of ticks, but there is no concrete evidence that they seek ticks out. Lyme disease was first identified in 1975, and the transmitter named as deer ticks. The insects do live on deer, but prefer smaller animals such as mice, chipmunks and squirrels. Infected ticks carry bacteria that causes a range of diseases. In addition to Lyme, a tick bite can result in ehrlichiosis, anaplasmosis, babesiosis, tick paralysis, Rocky Mountain spotted fever, Colorado tick fever and others. Symptoms can vary, making the illness difficult to diagnose, but frequently include fever, headache, fatigue and a skin rash. Wild Birds Unliminted: Do Turkeys Eat Ticks or Carry Ticks?